The word exercise comes from the Latin exercere, meaning to keep busy or at work. But what the typical adult does at work is sit in a desk chair for eight hours, plus a sitting-down commute both ways and an evening spent in front of the TV. This is a recipe for ruin. Sitting all day increases our risk for obesity and puts us at risk for back pain, poor posture, leg cramps, tense muscles and sheer boredom. Here’s something you can do about it. Exercise is simply the act of keeping your body busy, using your muscles and bones while your heart keeps pumping. You may feel you have no time to do any such thing amid all the rapid-fire e-mails and six-person conference calls (and reading Web articles like this one). You’re not alone. According to a survey by the National Center for Chronic Disease Prevention and Health Promotion, nearly 50% of adults in the U.S. admit that they don’t engage in the suggested 30 minutes, five days a week of moderate physical activity or the suggested 20 minutes, three times a week of vigorous activity. In short, about half of Americans don’t get the physical exercise they need. 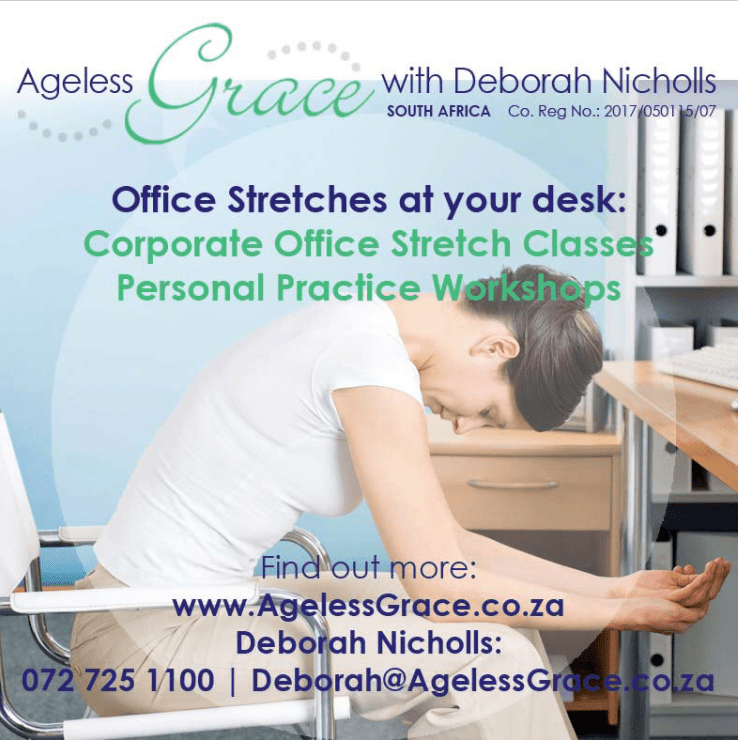 But there are exercises you can do right at your desk to help you improve your body’s flexibility and strength with nothing but a few minutes and your desk chair. Just remember to check with a doctor before starting any exercise regimen. Even when you’re not exercising, you should make sure you sit at your desk the right way, says Jason Queiros, a chiropractor at Stamford Sports & Spine, in Connecticut. Take the stairs (two at a time! ), not the elevator. Get up from your desk and go talk to your co-workers instead of e-mailing them. Park in the farthest part of the lot, or walk or bike to work. Sip water all day. A homemade lunch with lots of vegetables, fruits and whole grains will help you steer clear of the vending machine while keeping your wallet fat and your waistline trim. Above all, just don’t be lazy. or call 072 725 1100 for more information.